White fillings are done using a special material called "dental composite" that is firmly bonded to the tooth structure. 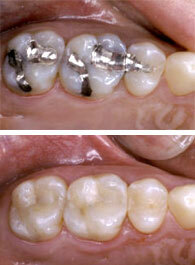 Nowadays composite are able to provide excellent function and aesthetics. Since they bond to the tooth, composite fillings restore most of the original strength of the tooth. Restore the natural appearance of the tooth. Teeth restored with white fillings are less sensitive to hot and cold than teeth restored with amalgam, if correct techniques are used. Composites are mercury-free. Mercury in the fillings is viewed by some as being toxic. Composites require less removal of tooth structure. The size of the hole made for the filling is dramatically smaller with composites.